Demi Lovato takes on the role that made her famous as Mitchie Torres again in Camp Rock 2: The Final Jam. This time around, Mitchie's biggest concern isn't fitting in, it's saving Camp Rock from being closed down. J-14 chatted with Demi exclusively on the Canadian set where she revealed movie deets! Camp Rock 2: The Final Jam premieres tomorrow night at 8 p.m. ET on Disney Channel. J-14: How is your character in different Camp Rock 2 versus the first Camp Rock? Demi: Mitchie is definitely not as pure anymore. She's really just excited to be at the camp. She's basically in love. J-14: Mitchie was uncomfortable the first movie. Is she more confident now? Demi: This movie she's not insecure anymore so she's definitely more confident. We're kind of parallel. In the first movie we were a lot more alike because we were both growing up and now we found who we are. Mitchie's totally different than me, but in a way we kind of are the same. 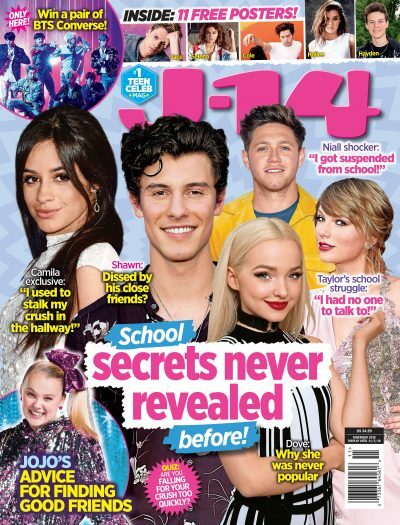 J-14: What's going on with Mitchie and Shane (Joe Jonas)? Demi: They are official, sort of — he obviously comes to the camp to be with her and she comes to the camp to see him again. This time around, he's there the whole summer — his intentions of coming are to be with her more and spend time together. J-14: What's your favorite song you're performing in the movie? Demi: I loved performing "It's On." It's just fun! J-14: What was the hardest thing about being on the Camp Rock 2 set? Demi: I think just being outside in the cold was really difficult. J-14: What did you do to keep your mood up? Demi: Drink lots of coffee!